Not one of those 'fit-bands', an actual sports watch! We are seeing more and more fit-bands coming out lately, mostly with accelerometers to track your steps but the Adidas miCoach FitSmart is more a running & workout watch than a fit-band. With it’s built in heart rate monitor and paired with your phone you can get more data. But also it doesn’t count your daily steps: this is a sports watch. In the box you’ll find the watch itself and a little charger cable. This is the same HR monitor you can find in the TomTom Multisport Cardio and the Garmin Forerunner 225. The watch itself has a nice silicone soft strap, that even when wearing tightly didn’t annoy me. Sometimes harder straps can start to cut in your wrist or cause some rash when sweating, but it feels really natural and smooth. In using the wrist HR monitors, I tend to see that they are more accurate when the strap is quite tight. Tighter than normal day-to-day wear. With the softness of this, putting it on tightly is not bothersome. Good choice on material. The watch comes in two lengths for the strap, for my small wrists I needed the ‘S’ and still the strap is pretty long. If you want to be 100% sure which one you need Adidas has provided a printable size guide. Pairing up with your phone. 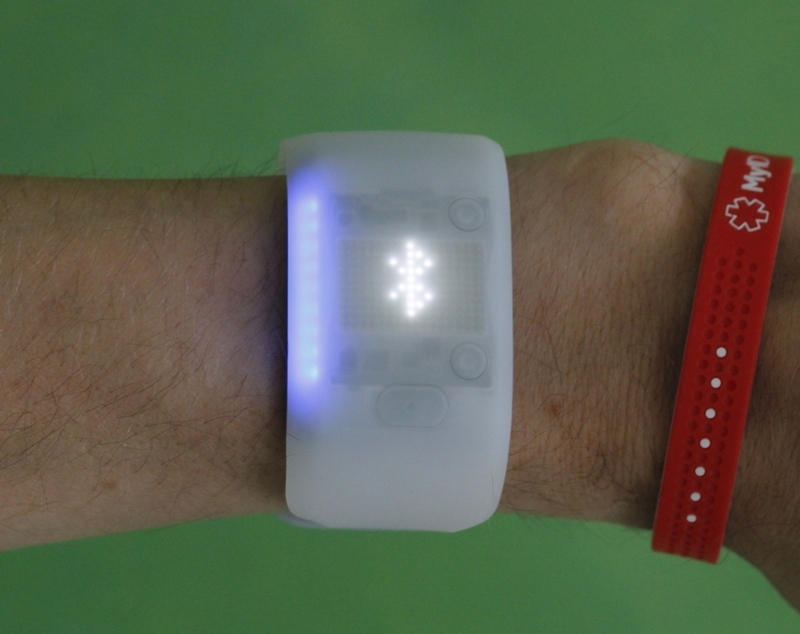 The watch face is a small led grid, to see the time you need to tap the button. This is good on energy use, but a bit annoying if you casually want to check the time (or take a photo of it!). Upon first use you need to pair it with your phone. This will sync it with your account and set the time. The watch is pre-loaded with an assessment workout (AW). 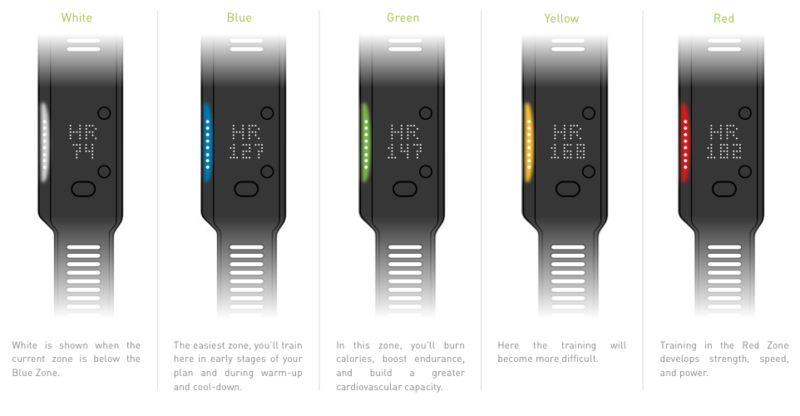 This will help the app and watch calibrate and determine your workout zones. You can do this with and without your phone, but I recommend using your phone. You can skip it, but after you’ve done the ‘AW’ the app should understand you better. You can do a workout with just the watch or paired with your phone and you don’t have to stick to running. Recording your movements during a strength workout will give you some indications too. If you don’t want to think ahead or never plan a session to detail, you can just start a free workout. This is done by choosing the ‘Free’ option and off you go. You won’t get any coaching (speed up, slow down) but you will be able to see your zone (color) and see the metrics, heart rate, time, pace, and stride rate (cadence). More about this below. 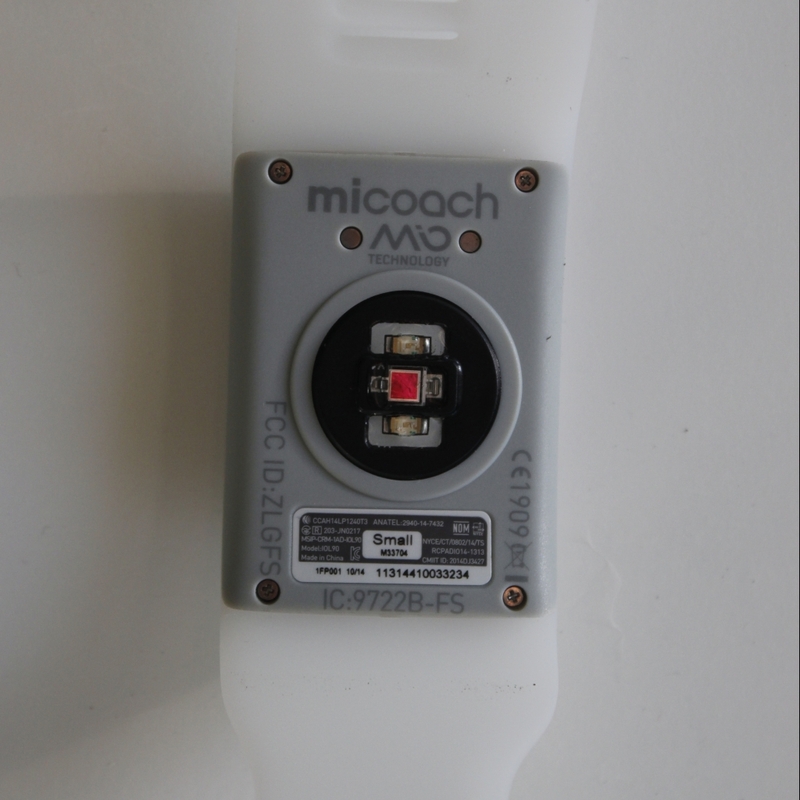 The best way to use the Fit Smart is to use it in combination with the miCoach App. It’s available for free for iPhone, Android and Windows and will allow you to track with GPS. Without GPS the data is available, but pace / speed is a calculated guess (doing the assessment workout is important here). Using it with the app will synchronize all your data automatically when you’re done and you can upload some workouts to the watch for later when you want to run without your phone. You will also get feedback, time and distance based updates on your session and you can play music! I’ve attempted to use the watch with different other apps, but I have not been successful, so you’re stuck with the Adidas miCoach app, but it’s pretty complete. 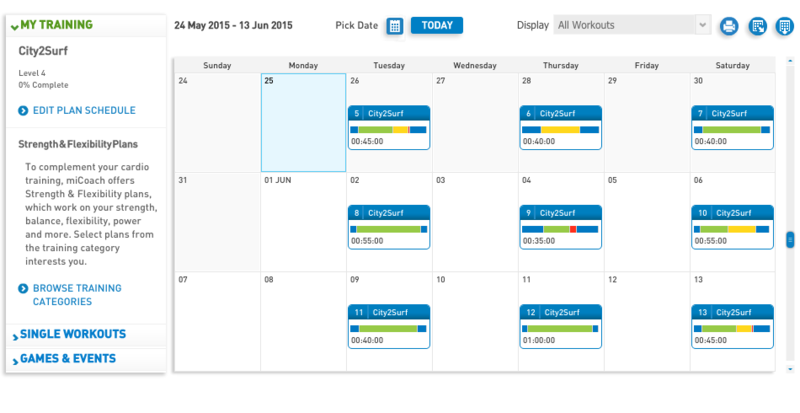 You can even create a complete Training Plan on your phone. But you can also setup the displays and sync workout to your phone. Overview of a workout on the watch. Setting up the displays on your Fit Smart. If you are planning for an event you can easily get a pre-made training plan, besides running you can also pick workout plans for other sports like basketball, rugby, soccer, tennis, etc. etc. White, Blue, Green, Orange and Red. White is the lowest ‘below’ any defined zone. Going up to red, your resistance zone. During your workout, the feedback will inform you where you are and need to be. A look on your watch will show you the color and on regular intervals and changes in your session will give you an update on what to do. 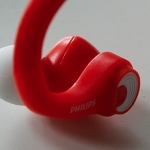 It will do so via audio, but also on the Fit Smart. After a little vibration, the display will show chevrons going up, down, or pointing to the center. Telling you to speed up, slow down or keep your pace. Really intuitive and you don’t have to think about numbers, just ‘do as your told’. The indicators on what to do during your session. 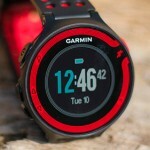 Summing it up, the watch is a really nice addition if you’re a runner and have only used your phone up until now. Working on heart-rate and seeing your cadence can take you to the next level. 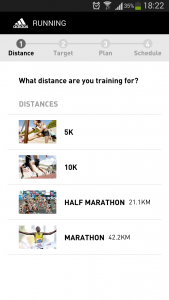 Combined with the coaching capabilities in the app, and the added training plans, this watch can definitely help you run that first half or full marathon. 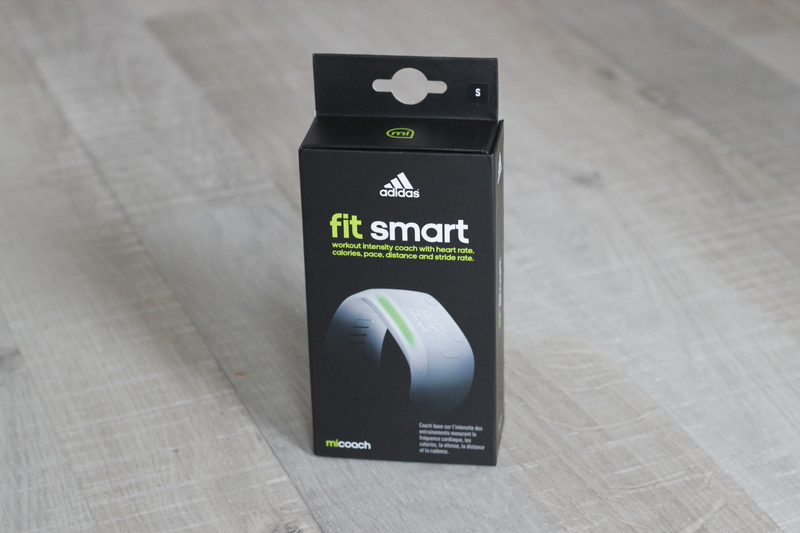 If you like my reviews, you can support me by buyting the Fit Smart for $40 on Amazon. Using this link I get a small fee but you just pay the normal price! If you want to read more about ‘how to’ you can find the user manual here.